You’re exhausted all the time – even after sleeping for more than 9 hours, you still feel beat, foggy, and irritable. You’re not sure what’s going on, but after your husband tells you he witnessed you stop breathing when you were asleep the other night, you knew you needed to do something. After speaking with your doctor, she ordered a sleep study and discovered you have sleep apnea. The CPAP machine isn’t the most comfortable device around, but it helps a little. You wish there was another way to treat your sleep apnea in Freedom, WI, but this machine is the only option, right? Thankfully, with the team at Dental Expressions, you have dental treatment options that can make the CPAP better for you, or even replace it altogether. 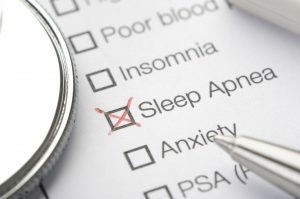 Find out about sleep apnea and how we can help you get the rest you deserve in this post. Drs. Robert and Heather Heil explain that sleep apnea is the second most common sleep disorder after insomnia. Most people who have this suffer from obstructive sleep apnea – when you sleep, your tongue and lower jaw relax, sliding against the back of your throat and blocking your airway while you rest. Since your body is wise enough to know you’re not getting the oxygen you need, you’ll wake up, but often not remember it. These “micro-arousals” can happen hundreds of times a night – leaving you exhausted, but without knowing the reason why. If you’re diagnosed with this sleep disorder, you’ll most likely be prescribed a CPAP machine. Since the tubing can be cumbersome, and the air pressure can be uncomfortable, many people stop using their CPAP – and no treatment is effective if patients don’t use it. If CPAP isn’t right for you, or if it doesn’t work strongly enough, we can use Custom Oral Appliance Therapy (COAT). We will fit you for an oral device that looks similar to a nightguard. This will gently shift your lower jaw and tongue forward while you sleep, allowing you to breathe easy. COAT is safe and effective – it works well for the vast majority of patients. And, it can be used in conjunction with CPAP to give you the best treatment possible. So if you’re having trouble getting the rest you need, schedule an appointment with Dental Expressions – we’re here to get you back to sleep!